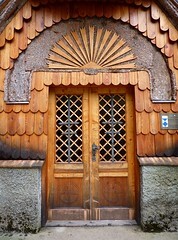 These are the doors to the Russian Orthodox Chapel on Vrsic Pass in Slovenia. It was built by Russian prisoners of war in 1916/17 as a memorial to those POWs and guards killed in an avalanche in March 1916. POWs were ordered to keep the pass clear the pass of snow as Kranjska Gora had become a strategically important access point to the front. The chapel is surrounded by prisoner’s graves. The chapel was renovated in 2005. The road on which the chapel sits was renamed Russian Road in 2006.